Improve Grip Strength: How To Get Your Grip Stronger! Your guide to improve grip strength! Or rather, the strength of your grips. There are actually several different kinds of grip and hand strength. Choose to work on the one that will benefit your sport or hobby the most. Or just work all of them for all around grip and finger power! The different ways to improve grip strength are interrelated. Getting stronger at one grip style will also strengthen the others a bit, and working them together is a great combo! These are the most common types to improve grip strength. Work on them 'till you can close your hand in one crushing movement and form a fist of iron! There are lots of products on the market that focus on this kind of grip. There are crush-able tennis balls, rubber toys, and others. The best ones I have found, though, are the metal Captains of Crush Grippers like the ones pictured to the right. These guys come in several weights, so you can work up to a darn strong grip if you choose. Also, they're metal and thus will last much better than the flimsy plastic knock-offs you might see around. You'll really be crushing with these guys. The pinch grip is just that, working on pinching. This grip focuses on the thumb and its inward movement. This grip is easier to work than the crushing grip. All you need to do is go to your gym and take two heavy metal weight plates and pinch them together. The heavier the plates and the longer you pinch them, the stronger you get. It's just that simple! You need to work on opening the hand as well. This balances the crushing movement of your hand extensors & keeps your hand and forearm muscles healthy. The best way of doing this is getting large rubber bands for expanding your hand. You can find special ones for strength training in sports stores. Simply put them around your closed fingers and open your hand - or try ;-) Seriously, this will work your hand in new and unfamiliar ways. Wrist and forearm strength go hand in hand with grip strength. Building them focuses more on the flexing movements of the wrist than on engaging the fingers to crush together. There are tons of options for your workout. Wrist curls are popular, but they're just the beginning. Just pick up anything heavy and move it around by flexing your wrist! Work with a wrist roller to work your forearms, get a heavy sledgehammer and swing it by just flexing your wrist, or get a short barbell and try to flex it forward. You could even hold a bowling ball with one hand and just flex it around, or swing a heavy sword. 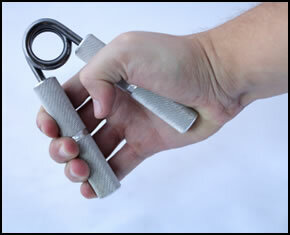 There are 4 different kinds of grip strength described in this article. Naturally, they overlap at points; but you should work on each of them discretely to get the best results. A good method is to work 2 of them for a week or two, and then switch to the other grip exercises for a week or two. That way they overlap, helping each other get stronger and you won't get a muscular imbalance in your hands and forearms. And remember to improve grip strength on both hands. Having two strong hands is always better than one. 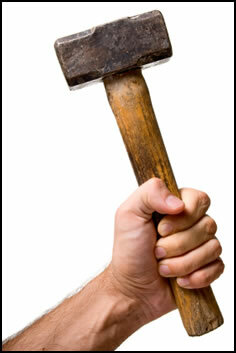 Now go out there and crush something with your hands - build that grip! • Click HERE to leave 'How to Improve Grip Strength' & learn more about hand grip exercise! 1. Brookfield, John. 1995. Mastery of Hand Strength. Nevada City, Calif: IronMind Enterprises.